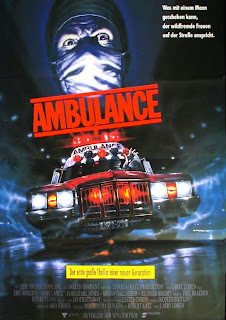 Here's another great Larry Cohen flick for ya. As always, the title perfectly sums up what horrible monster will come charging after some unlucky sap, this time none other than Julia Robert's brother, Eric. The rest of the story is so obvious and self explanatory I won't even waste any time on it. You don't watch Larry Cohen movies for intricate story lines, but for the sheer entertainment value. As such, The Ambulance is perfect viewing on a hungover Sunday or when procrastinating a college paper. It doesn't make much sense, but heck, does anything? Entertaining movie, even though i kept forgetting what the plot was lol.